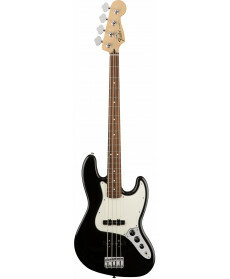 Baixo Eléctrico Fender Standard Jazz Bass PF Blk. Cor: Black. Combining traditional design with contemporary features, the Standard Jazz Bass is an elegant and affordable classic designed for the bassist who appreciates great style, rich and versatile tone, and excellent value. 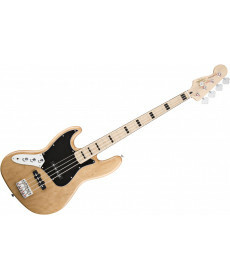 Baixo Eléctrico Fender Player P Bass PF PWT. Cor: Polar White. 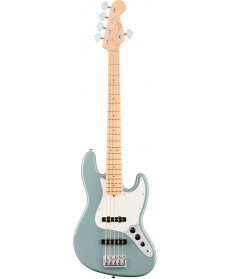 There’s nothing more classic than a Fender electric bass, and the Player Precision Bass is as authentic as it gets - genuine Fender style and the rumbling, seismic sound that spawned a thousand imitations. 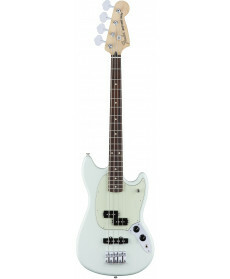 Baixo eléctrico Fender Mustang Bass PJ PF OW. Cor: Olympic White. This updated version of the short-scale underground hero adds the power of our venerable P Bass® and J Bass® pickups to the traditional Mustang design for flexible, thunderous bass tone with smooth playing feel and slick visual style. 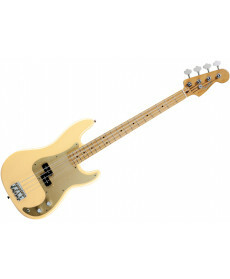 Baixo Eléctrico Fender Squier Vintage Modified Jazz Bass LH 3SBS. Corpo: Basswood; Acabamento: Gloss Polyurethane. Braço: Maple; Formato: "C"; Acabamento: Gloss Polyurethane. Escala: Indian Laurel 34" (864 mm); Raio: 9.5" (241 mm). Neckjoint: Bolt-On. Inlays: Dot Branco. Ferragens: Ponte: 4-Saddle Vintage-Style; Pestana: Osso Sintético; Carrilhões: Standard Open-Gear; Cromado. Trastos: 20 Medium Jumbo. Pickups: 2x Single-Coil Fender®-Designed Jazz Bass®. Modelo de Canhoto1. Cor: 3 Color Sunburst. Squier's Vintage Modified Jazz Bass Left-Handed delivers great traditional Jazz Bass style and performance, with dual Fender®-designed pickups and a familiar slim "C"-shaped maple neck. Baixo Eléctrico Fender Squier Bronco Bass BLK. Corpo: Agathis; Acabamento: Polyurethane. Braço: Maple; Formato: "C"; Acabamento: Polyurethane; Pestana: 1.5" (38.1 mm). Escala: Maple 30" (76.2 cm); Raio: 9.5" (24.1 cm). Neckjoint: Bolt-On; Neckplate de 4 parafusos. Inlays: Black Dot. Ferragens: Ponte: 2-Saddle Chrome; Pestana: Osso Sintético; Cromado. Trastos: 19 Medium jumbo. Pickups: Single coil Special Design. Modelo de Canhoto1. Cor: Black. 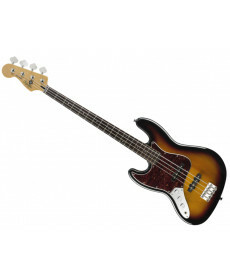 The Squier® Bronco™ Bass is ideal for guitarists who occasionally need a bass, younger beginners, players with smaller hands or anyone who prefers the feel of a short scale (30") bass. 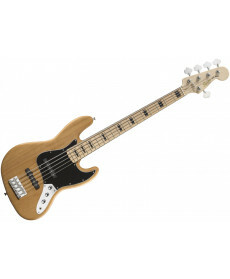 Baixo Eléctrico Fender Squier Vintage Modified Jazz Bass '70s LH NT. Corpo: Soft Maple; Acabamento: Polyurethane. Braço: Maple; Formato: "C"; Acabamento: Polyurethane; Pestana: 1.5" (38.1 mm). Escala: Maple 34" (86.36 cm); Acabamento: Gloss Finish; Raio: 9.5" (24.1 cm). Neckjoint: Bolt-On; Neckplate de 4 parafusos. Inlays: Black Block. Ferragens: Ponte:Standard 4-Saddle; Pestana: Osso Sintético; Cromado. Trastos: 20 Medium jumbo. Pickups: 2x Single Coil Duncan Designed™ JB101. Modelo de Canhoto1. Cor: Natural. 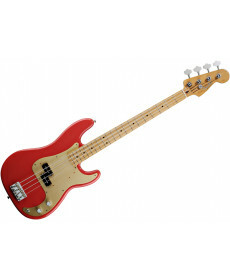 Baixo Eléctrico Fender '50s Precision Bass HB. Corpo: Alder. Braço: Maple; Formato: "C"; Acabamento: Satin Finish; Pestana: 1.75" (44.45 mm). Escala: Maple 34" (86.36 cm); Raio: 7.25" (18.41 cm). Neckjoint: Bolt-On; Neckplate de 4 parafusos vintage style. Inlays: Black Dot. Ferragens: Ponte: American Vintage 4 Saddle; Pestana: Osso Sintético; Cromado. Trastos: 20 Vintage Style. Pickups: Vintage Precision Bass®. Modelo de Canhoto1. Cor: Honey Blonde. 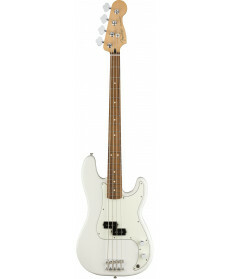 Baixo Eléctrico Fender '50s Precision Bass FR. Corpo: Alder. Braço: Maple; Formato: "C"; Acabamento: Satin Finish; Pestana: 1.75" (44.45 mm). Escala: Maple 34" (86.36 cm); Raio: 7.25" (18.41 cm). Neckjoint: Bolt-On; Neckplate de 4 parafusos vintage style. Inlays: Black Dot. Ferragens: Ponte: American Vintage 4 Saddle; Pestana: Osso Sintético; Cromado. Trastos: 20 Vintage Style. Pickups: Vintage Precision Bass®. Modelo de Canhoto1. Cor: Fiesta Red. Baixo Eléctrico Fender Squier Vintage Modified Jazz Bass V NT. Corpo: Soft Maple; Acabamento: Natural Gloss. Braço: Hard Maple; Formato: Modern "C"; Acabamento: Natural Satin. Escala: Maple 34" (86.36 cm); Acabamento: Gloss Finish; Raio: 9.5" (24.1 cm); Pente: 1.875" (47.6 mm) em White PPS. Neckjoint: Bolt-On; Chrome Squier® Neckplate de 4 parafusos. Inlays: Black Block. Cutaway: 18. Ferragens: Ponte: Standard 5-Saddle; Truss-rod: 580 Double II Adjustable; Hardware: Cromado. Trastos: 20 Medium jumbo. Electrónica: Passiva. Pickups: 2x Duncan Designed™ JB-105B Alnico 5. Modelo de Canhoto1. Cor: Natural.